Our physical body is alive because of the ‘life force energy’ that is flowing through it. If our ‘life force’ is low or blocked, we are more likely to get sick, but if it is high and free flowing, we more easily maintain health and a feeling of well-being. One thing that disrupts and weakens the flow of ‘life force energy’ is stress. Stress is often caused by conflicting thoughts and feelings that get lodged in one’s subtle energy system. These include fear, worry, doubt, anger, anxiety, etc. Medical research has determined that continual stress can block the body’s natural ability to repair, regenerate and protect itself. The effects of unreleased stress range from minor aches to major health concerns, such as heart disease, digestive disorders, respiratory and skin problems. Reiki (ray-key)is a technique that aids the body in releasing stress and tension by creating deep relaxation. Because of this, Reiki promotes healing and health. The word Reiki is made of two Japanese words – Rei which means “the Wisdom of God or the Higher Power” and Ki which is means ‘life force energy.’ So Reiki means ‘spiritually guided life force energy.’ The Reiki system of healing is a technique for transmitting this subtle energy to yourself and others through the hands into the human energy system. 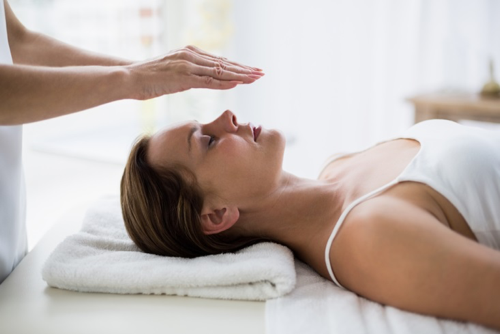 Reiki restores energy balance and vitality by relieving the physical and emotional effects of unreleased stress. It gently and effectively opens blocked meridians, nadas and chakras, and clears the energy bodies, leaving one feeling relaxed and at peace. Reiki is powerful, yet wonderfully gentle and nurturing. During a treatment, the clients remain fully clothed. Reiki supports any medical, or supplemental healing methods a client may be using. Reiki in Poole, Dorset… feel the life force energy.